Hamsters are adorable and curious creatures that exhibit some of the most interesting or baffling behavior. As a hamster owner or a prospective owner of hamsters in the future, you should have an understanding of what these behaviors mean. One commonly discussed aspect of hamster behavior is burrowing. Do all hamsters burrow? 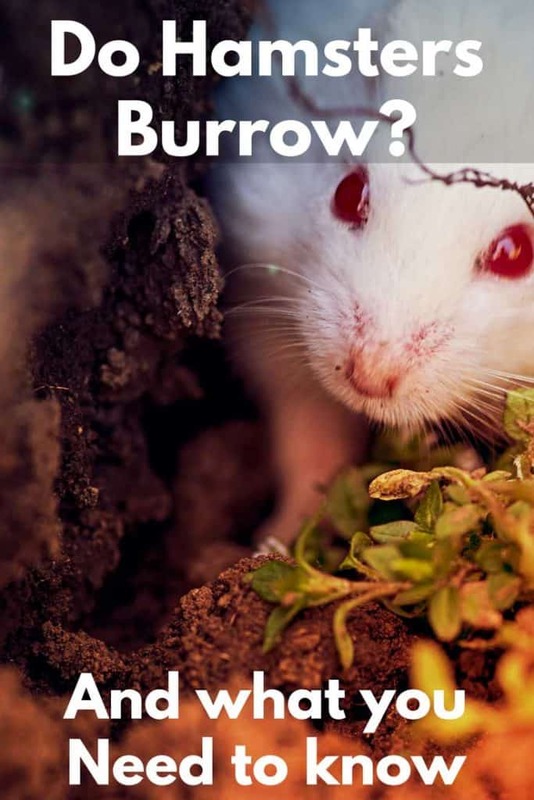 Why do to hey burrow in the first place? We’ve done the research to bring you some solid answers! Yes, hamsters are burrowing animals. Hamsters burrow in the wild, creating networks of tunnels and caves wherein they sleep and store their food. This is done for a number of reasons, including warmth and protection for the poor-sighted creatures from predators. Having a hamster in a domestic setting does not strip them of this natural burrowing impulse. Many hamsters will do this when and where they can, including inside their cage. Knowing this, you’re probably wondering how you, as a hamster owner, can help facilitate healthy and happy burrowing for your pet. You might not observe your hamster burrowing much, if at all, and wonder if it’s normal for them to be disinterested in this behavior. You may even wonder if they are burrowing too much, or for any unhealthy reasons. By reading on, you will have all of these questions and more answered. In the wild, hamsters burrow for a number of very good reasons. They often create intricate networks of burrows that are connected via tunnels so that they may move unfettered underground. It helps to protect them from the potentially harmful environmental conditions outside, as well as offer them protection from their natural predators. Burrows are also exceptional for storing food. The action of burrowing itself can prove to be good exercise and wholesome fun for hamsters, as well, both in and out of the wild. A hamster’s environment in the wild is obviously very different from a domestic one, but this does not remove their innate instinct to burrow. Even though the hamsters in your home (hopefully) have no reason to fear predators, environmental conditions or food instability, a great number of domestic hamsters across all breeds engage in this behavior. So, if you see your hamster burrowing into his or her bedding, don’t be alarmed! They are only doing what nature has made them inclined to do. Their burrowing behavior does not mean that they are frightened or want to hide from you. Hamsters of all breeds have been observed burrowing both in the wild and in domestic settings. Syrians, Dwarf hamsters and Chinese hamsters (the most popular/common pet breeds of the hamster) may exhibit varying levels of interest in burrowing. This can range from an aggressive, insistent interest to no interest at all. Whether your hamster is a burrower or not, you don’t need to worry. It’s not unhealthy for them if they do not burrow, nor is it unhealthy if they love to burrow a lot. Not all hamsters are as inclined toward burrowing as others, with some having seemingly no interest in doing so at all. If you are curious about your own hamster’s feelings on the subject or want to facilitate and encourage the burrowing behaviors that you have already witnessed in them, you should set up a burrowing area within or outside of their enclosure. You have plenty of options where it comes to setting up a specific burrowing area for your hamster. If his or her cage is large enough, consider the addition of a partition so that you may make one side more suitable for burrowing while keeping the other relatively unchanged. If you were to simply try to add more bedding to create a burrowing corner in your hamster’s cage, you will find that it will quickly fall apart – or the hamster may decide to gather up all of their bedding into one side, leaving the other bare. While this isn’t harmful, it is certainly not ideal. For this reason, creating a separated burrowing spot for your hamster is the best option. If a partition isn’t possible, you can create a secondary enclosure that facilitates their burrowing behavior. You will have to remove them from their cage to this second enclosure when you want them to have some quality burrowing time. 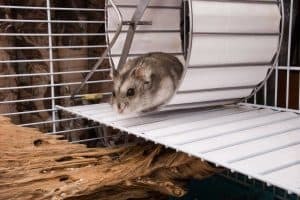 This isn’t ideal, as hamsters should be able to burrow at their leisure, so consider finding a way to connect the two enclosures so that your hamster can burrow to his or her heart’s content. A third option is to place a designated “burrowing bin/box” in the hamster’s existing cage. This can easily be done with something like a tissue box. There are many tutorials online as to how to do this, so while the instructions below may not fit your style, you will likely find a step-by-step guide to constructing your own burrowing box that does. Empty the tissue boxes, if they aren’t empty already. Cut a small, circular hole in the bottom of one of the boxes. The hole should be just large enough to accommodate the size of a toilet paper tube. Cut off any plastic that may still be on either or both of the boxes. Cut a semi-circle shape into the toilet paper tube and attach it to the box that you cut the hole in. This will make the top section. Add bedding or other burrowing material, whichever you choose and is safe for your pet. Some hamster owners like to use the (unscented) tissues that came in the tissue boxes in the first place. Insert the tube down into the uncut box, which functions as the bottom of the burrowing box. Voila – You’re done! You don’t have to glue anything. Barred cages are the most popular solution for housing hamsters, but they do not facilitate burrowing as well as tanks, like aquariums and terrariums. Cages with bars have the problem of mess accumulating around the cage, which also means that the bedding that’s intended to be inside of the cage is getting tossed out. This could be especially problematic if your hamster is an avid digger or burrower, as they’re not going to pay attention to where their bedding is going as they dig. What they will notice, however, is the rapidly dwindling amount of bedding in their cage. Tanks are ideal for burrowing, but this doesn’t mean that your hamster can’t burrow when they are in a traditional cage with bars. You just may have a bit more mess to pick up every now and then. Fortunately, the bedding that you already have in your hamster’s enclosure is perfectly fine to use in their burrowing environment as well. What matters more is how much bedding you use – which may depend on the hamster and their eagerness toward digging and burrowing, as well as their size. Dwarf hamsters, for instance, will likely require a shallower burrowing area than larger Syrian hamsters. How much bedding you use will also depend on the height and width of your enclosure. If you have a tank that stands at sixteen inches tall, for instance, filling any portion of the tank (even with a partition) with ten inches of bedding doesn’t leave you a lot of space between the top of the enclosure and the mound of bedding. It may also make it difficult for the hamster to access. Your best bet is to add four to seven inches of bedding in the area that’s to be purposed for burrowing and then observe your hamster’s reaction to it. You can easily add more or take some away if you’ve found that this amount is too much or too little. One of the most common problems hamster owners face when their pets burrow is the matter of their hamster becoming “lost.” The word “lost” is in quotations because, much of the time, the hamster will still be in their cage even when their owner hasn’t been able to find them amid the heaps of bedding. If you keep a litter box or sand bath in your hamster’s cage, you may also find them burrowing in there. While it’s no big deal for them to burrow in their sand bath, the litter box may pose a problem. It simply isn’t healthy for any hamster to be burrowing around in his or her waste. Hamsters are known for being goofy with a wide array of personality traits that may make us laugh or scratch our heads, with burrowing being one of them. There is absolutely no harm in burrowing or not burrowing, as the animal’s enthusiasm for it depends entirely on their personality. If your hamster has no love of digging around and nesting in their bedding, don’t fret. Similarly, it’s also of no concern if your hamster seems to really, really like burrowing. As long as the bedding that they are using is clean, this action is totally healthy. The best thing that you can do is to create an environment for your hamster where they can burrow at their leisure. There are lots of ways to do this, as the information above illustrates. Observe your hamster and gauge their burrowing behaviors, if any, as you consider what steps to take next in creating the best burrowing area for your little buddy. Next PostShould You Cover Your Hamster’s Cage at Night?